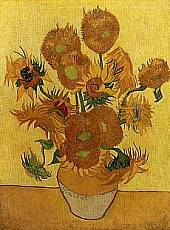 Some psychiatrists have proposed that Van Gogh, who clearly suffered from some kind of mental illness in his last years, may have had absinthe or foxglove poisoning, which can cause a yellow tint to one's vison. that's all fine and good for psychologists. but one would think that physiologically a manifestation of yellowed vision would be an overcorrection towards violet tones to compensate.